The use of unmanned technologies is not a new concept, but how we develop and use them to exploit the vast oceans will influence the U.S. Navy’s ability to operate in our home waters and around the world. To protect our national interests and keep our soldiers and sailors safe, we must be continually preparing for the next potential threat — and the next conflict may highly depend on unmanned technology. Detect and strike enemy combatants remotely and discretely, neutralizing enemy threats without putting sailors at risk. Clear a mined strait within hours, quickly and cheaply, with a swarm of hundreds, if not thousands, of small unmanned mine-hunting vehicles. Assign a drone to follow an adversary’s submarine at safe distance from the moment it leaves port to the time it returns. Assign an unmanned surface vessel constant guard of a critical port or infrastructure. These capabilities do not yet exist, but they will soon. The U.S. Navy has begun investing in unmanned undersea and surface vehicles, or UUV and USV, at a greater pace. 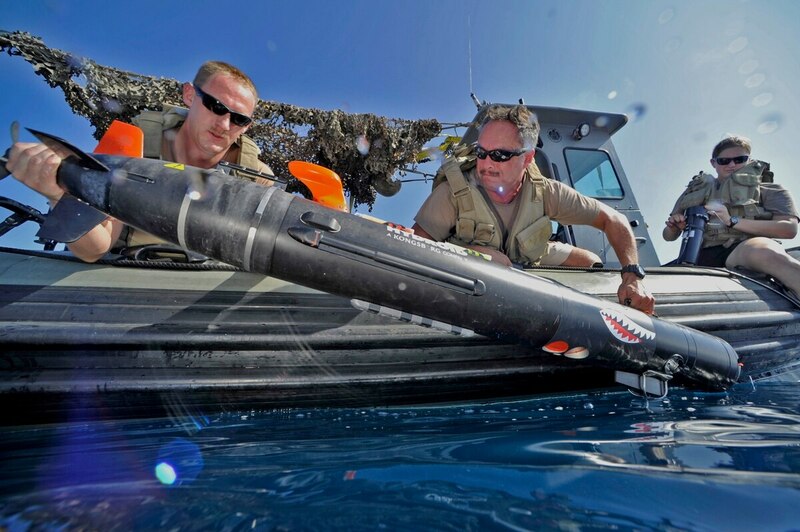 UUVs and USVs will enable more efficient warfare operations by independently performing, or cooperatively enhancing, certain tasks performed by manned submarines, surface ships and aircraft. They can provide access to areas that are prohibitively expensive, time-consuming or too hazardous to reach with manned platforms. This stealthy underwater device reportedly sticks itself under the hull of an enemy vessel with electromagnetic magnets. And then BOOM. These platforms will enable real-time, long-distance, over-the-horizon targeting in areas that are currently unreachable. Unmanned vessels range in size from small, man-portable devices to much larger platforms that are more than 50 meters in length. UUV/USV size is a function of power storage, sensors, payload and launch platform. Capability development will be driven by several core characteristics: endurance, sensors/payload, autonomy, command, control and communications. Power storage will be an important enabler moving forward because energy retention is critical for endurance. The Navy is perfecting lithium-ion batteries and working with the automotive industry on fuel cells that will optimize time at sea. Furthermore, by leveraging advances in artificial intelligence, the Navy also hopes to reach the point where autonomous devices can shift to more open knowledge-based and probabilistic decision-making, and even perform their own reasoning. The Navy is driving affordability into every part of the process and expecting rapid technological improvements to enable near-term adoption. When the new equipment becomes cost-effective, the service expects to buy large numbers of platforms and enabling technologies to conduct dangerous missions that have, until now, been just an idea. These systems will complement the larger fleet architecture by filling capability gaps as a force multiplier for existing platforms. Specific inventory requirements are not yet defined as part of the most recent 30-year shipbuilding plan, released in concert with the 2019 presidential budget request. However, one thing is certain: Near-term insertion of small and medium-sized UUVs/USVs will be a focus within the next one to five years. Over the next 10 years, the number of attack submarines will decrease by 25 percent, giving concern to combatant commanders around the globe. As the Los Angeles-class submarines begin to retire in significant numbers, the attack submarine force structure totals will drop in a time of great power competition with China and Russia. UUVs can effectively fill some of these gaps and will improve the performance of available attack submarines in peacetime and wartime to mitigate reduced force size as the Virginia-class submarines enter the fleet. The Trump administration wants to make it easier to sell weapons abroad. Here's its plan. Some of the U.S. Navy’s current development programs include the Knifefish for hunting bottom and buried mines; the Snakehead large displacement UUV for intelligence, surveillance and reconnaissance; the extra large Orca UUV for mine warfare; and the Sea Hunter medium displacement unmanned surface vehicle. The Knifefish has already undergone sea acceptance trials, and the U.S. Navy expects further fleet integration this year. The Defense Advanced Research Projects Agency has officially transferred Sea Hunter to the Office of Naval Research, which will continue developing the revolutionary prototype vehicle. These UUVs/USVs will integrate into the fleet over the next few years; and along with advanced computing, big-data analytics, AI, robotics, directed energy, hypersonics and biotechnology, they will help us deter our adversaries and ― if faced with conflict ― win the wars of the future. Rep. Rob Wittman, R-Va., serves on the House Armed Services Committee, where he is the chairman of the Seapower and Projection Forces Subcommittee. He also serves on the Natural Resources Committee.